By Karen Leroux, based on an interview by Leigh Meinert. Leadership development, underpinned by the values, history and tradition of Africa’s oldest liberation movement, the African National Congress, has to evolve, adapt and experience intergenerational renewal to be relevant to today’s youth, claims Febe Potgieter-Gqubule, social and political activist, former ambassador to Poland and member of the ANC’s National Executive Committee. It was during her stint with the South African Youth Congress that Potgieter-Gqubule first encountered political education, a facet of leadership development that would become an enduring passion. 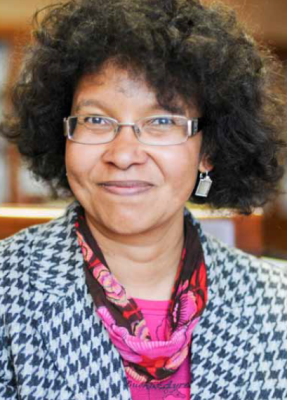 “One of the techniques of bringing about positive social change is by expanding the pool of people who want to bring about change and want to make a difference by providing them with the requisite skills, exposure and responsibility to be able to make that difference and make those changes,” maintains Potgieter-Gqubule. Yet another string to Potgieter-Gqubule’s professional bow was her ambassadorship to Poland, a lofty position that she held at a relatively youthful age. “It was really interesting in the sense that leadership development is also about getting people outside of their comfort zones and I think that was one of the take aways the four years in international relations provided for me. “It means you are out of the country. You are in an area where people do not know you, so it provides a sense of freedom where there are no expectations, but at the same time, you have to prove yourself all over again.” One of her legacies was pushing for more gender equity in the Foreign Service. “For example, out of about eighty-five resident ambassadors in Warsaw, there were only twelve women ambassadors at any given point in time. So there was always an issue about the questions facing women and how you make your space within that. One of the things we started was an association for women in diplomacy – not just woman ambassadors but also woman diplomats,” recalls Potgieter-Gqubule. Part of her personal mantra is to build continuity in leadership and leadership development. “Organisations need to reproduce leadership and, with an organisation with as long a history as the ANC, you have to make sure you transmit the values, history and traditions but also ensure you renew and remain relevant. The assumptions my generation made are not the same as today’s generation. You need to make sure you adapt and encourage intergenerational dialogue, the transmission of ideas and really listen to each other.” “In the ANC, leadership takes place within a collective. Part of the underlying philosophy is to bring people together with different experiences and different points of view. It encourages a melting pot of solutions that is much better than if a single leader decides on the way to go. “I think it is a very strong element of the leadership model within the ANC. The relationship between action and reflection is also crucial in that leadership is not simply about talk, but about leading by example. So when we look at the ANC leadership collectives, we need to look at what it says about the ANC – its non-racial character, the mixture between different generations, the gender and the geographic spread. You need to reflect the diversity of your membership as well as the South African population and the kind of society that we all envisage – a united, non-racial, democratic, non-sexist South Africa. If you can’t live up to it as a movement, then how do you expect society to do that?” enquires Potgieter-Gqubule. Potgieter-Gqubule believes leadership success is measured by, firstly, “the ability to provide a vision that unites people and addresses the challenges of the day. It is about having a plan and a programme that address the challenges that face us in a way that will take us to where we want to be. Secondly, it is the ability to unite people behind that vision. “It is in all our interests to address unemployment, poverty and inequality. We need more and more people to participate in the economy, so it is about uniting people around those issues,” explains Potgieter- Gqubule. “There is often a sense that young people are empty vessels that you pour knowledge into, but I think we can learn so much from engagement with young people. They can provide information we do not even have the capacity to think about, or simply force us to confront issues in a new way by pushing the boundaries,” claims Potgieter- Gqubule with optimism.